A young Oregon Christian couple who relied on faith alone to heal their sick newborn twin daughter were sentenced to nearly seven years in prison for the baby's death in 2017 after pleading guilty to criminally negligent homicide, the Clackamas County District Attorney's Office announced Monday. 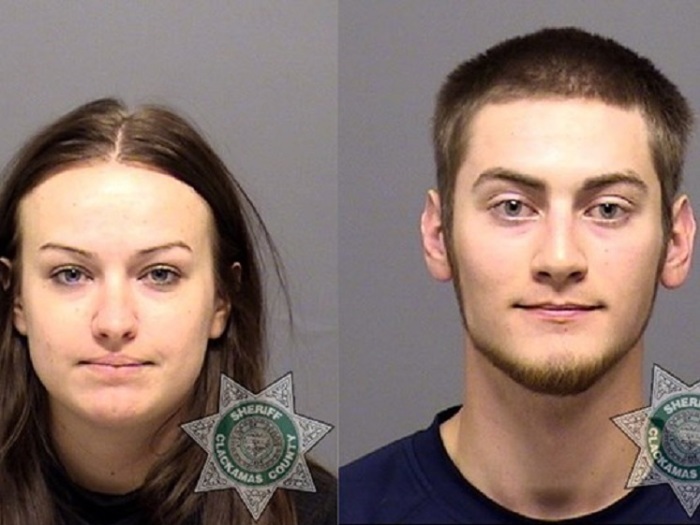 As a condition of their guilty plea, Sarah Mitchell, 25, and her husband, Travis Mitchell, 22, who were members of the controversial Followers of Christ Church in Oregon City, had to sign a statement saying: "We should have sought adequate medical care for our children and everyone in the church should always seek adequate medical care for our children." The 1,000-member Followers of Christ Church, which is not affiliated with any particular denomination, is a Pentecostal church that operates in Idaho, according to local news station KIRO 7. Their members believe that faith will heal every ailment. If someone dies, they see it as God's will. As a part of their plea deal, Sarah Mitchell's grandfather, Walter White, who founded the Followers of Christ Church, also had to sign a statement similar to the one his granddaughter signed and agree to prominently display their statements inside the church for the congregation to see and read. Sarah Mitchell's sister, Shannon Hickman and her husband, Dale, were convicted in 2011 of second-degree manslaughter and sentenced to six years in prison after their infant son died two hours after delivery in 2009 when they chose faith healing over professional medical help. "For far too long, children in this church have been needlessly suffering and dying because their parents, as a condition of their religious beliefs, have refused to seek medical care for their children. And for the past 17-and-a-half-years, the Clackamas County District Attorney's Office has been working diligently to hold criminally responsible any parents who fail to provide adequate medical care for their children which causes their death or serious physical injury," the district attorney noted in his statement on Monday. It was noted that it was the fifth case the Clackamas County District Attorney's Office has prosecuted in the past nine years and all of the previous cases went to trial without any admission of guilt or acceptance of responsibility. "Today, we believe we have taken a large step forward in that respect. The family members in this case have, for the first time, plead guilty and accepted criminal responsibility for their behavior. And they have also publicly acknowledged that they must seek adequate medical care for their children and they want all of their fellow church members to do the same," the prosecutor's office said. "This kind of public declaration has never been made before by such central figures in the church as Walter White and his daughter and her husband. We believe this holds great promise moving forward. We hope that this office is never again forced to prosecute parents in The Followers of Christ church for neglecting the medical care of their children. However, we continue to stand ready to do so if the members of that congregation do not heed the call of this family," the statement added. Sarah and Travis Mitchell were charged with murder by neglect and first-degree criminal mistreatment in the March 5, 2017, death of their daughter, Ginnifer Mitchell. Police say Ginnifer died after she developed breathing complications during the birthing process. According to the indictment, law enforcement was alerted to Ginnifer's death after church elder Carl Hanson called the medical examiner's office directly to report the death. Eric Tonsfeldt, a county deputy medical examiner who responded to the call from the elder, stated to investigators that the practice of calling the medical examiner's office directly was "very common, and in fact the norm" for the Followers of Christ Church. Tonsfeldt reported seeing about 60 church members in the home and later discovered that Ginnifer had a sister, Evelyn, who was also inside the home and was "at medical risk." Tonsfeldt said he told the couple and others at least three times that Evelyn's health was in danger due to her size and urged them to take her to a hospital. Sarah Mitchell's father told him, "Thank you for your input." After Tonsfeldt left the home, however, he called Oregon City police and asked them to do a welfare check on Evelyn. It was only after police arrived at the home and instructed the fathers of the couple and another man to take Evelyn to the hospital that they complied. Oregon State Medical Examiner Karen Gunson explained in an affidavit that Ginnifer died from complications of prematurity. She said the baby's lungs hadn't developed enough to work on their own and her death could have been prevented had she gotten the medical care she needed.